Coaches are obtained from the MERCEDES-BENZ network: EVOBUS – 2 rue du Vignolle - Z.I. 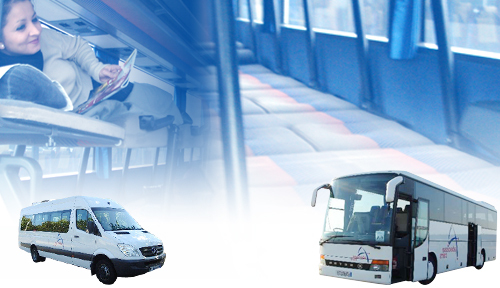 – 95842 SARCELLES – Tel: 01 39 92 77 77 – Fax: 01 39 92 77 63 – http://evobus.fr. The workshops are visited regularly. Alternatively, MERCEDES-BENZ - 17, rue Marcellin Berthelot – 91320 WISSOUS – Tel: 01 60 13 80 00 – http://www.parissud.mercedes.fr and MERCEDES-BENZ TECHSTAR – 104 rue Anna Lindh –RN6 -77240 VERT SAINT DENIS – Tel: 01 64 14 15 16 – http://www.techstar.fr . Our company benefits from a 24 hr on site assistance service provided by MERCEDES-BENZ mechanics throughout Europe. The coaches have the most reliable safety systems: ABS anti-lock braking – ESP (Electronic Stability Programme) for traction control – device for speed regulation to below 100 km/h. Mandatory technical checks on the coaches are carried out 6 monthly to ensure that safety mechanisms are functioning at optimal levels. This includes brakes, steering, suspension, tyres, lights and air circulation. These inspections are carried out by the Contrôle BAHU Company – 46, rue du Fer - 77176 Savigny le Temple – Tel: 01 60 63 07 63, Fax: 01 64 39 22 21 – http://www.vtweb.org. This company is registered with the organisation which issues a certificate of compliance to ABSCISSE CARS. On a daily basis, periods of work and rest alternate. A second driver is assigned for long journeys, in conformity with legal requirements. All our drivers have continuing training through regular courses held at the FFT Centre, 43, rue de l’université – 93191 NOISY LE GRAND – Tel: 01 43 05 11 77 – Fax: 01 43 05 89 56 – http://www.fftformation.com, which is registered with the appropriate authorities. This training keeps our drivers up to date with the most recent regulations and they receive the official certificate: “FCO”. The vehicles and passengers are covered by an insurance policy provided by “Groupe AXA France” (http://www.axa.fr). The policy number is 4436973704 and the customer number is 1702880304 delivered by the office of “AGENT GENERAL Monsieur Eric PHILIPERT” – 226 Place Emile Menier - 77196 NOISIEL - Tel : +33 1 60 05 48 06 - Fax : +33 1 60 05 52 00 - SOS TEL : +33 9 70 80 83 77. All of the following are authorised to check conformity with regulations: Inspectorate of Work in the Transport Industry: DDE – 288, Avenue Georges Clémenceau – Z.I. de Vaux de Penil – 77000 Melun – http://www.seine-et-marne.equipement.gouv.fr, Transport Police, the Gendarmerie and local Police. They also verify that both the documentation and the maintenance of vehicles’ equipment are in conformity with regulations. This includes licences, tachographs, unique risk assessment document, staff list, insurance, records of regular inspections, first-aid packs, fire extinguishers, driver rotas and qualifications, blood alcohol levels (zero tolerance), and declarations to SACEM (Society of authors, composers and editors of music) (copyright for radio and DVD players). The management of the Company’s accounts is in the hands of the office of a chartered accountant:MEAUX EXPERTS - M. Etienne PAGNY, 40 Quai Sadi Carnot - 77100 MEAUX, Tel: 01 60 23 02 00 – Fax: 01 64 34 28 71 – e-mail: contact@meaux-expert.com. Annual accounts are audited by the CENTRE DE GESTION AGREE DE SEINE ET MARNE (CGASM) 59, rue Pierre et Marie Curie – Zone Industrielle- 77000 VAUX LE PENIL Tel: 01 64 79 76 00 –Fax: 01 64 79 76 09 – http://www.cgasm.com. Customers who want information on the status and the quality of services offered by « ABSCISSE CARS » may, at any time, without previous authorisation, consult the above organisations as to the reliability of information given by the company.